Dress up some RITZ Crackers with cheesy, bologna-topped awesomeness to show someone you think she's a star! 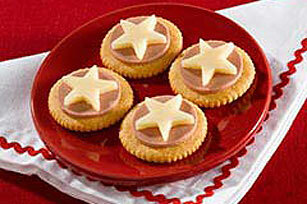 Cut 4 (1-1/2-inch) circles out of bologna slice, then cut 4 (1-1/4-inch) stars out of Singles. Top each cracker with 1 bologna circle and 1 Singles star. Prepare as directed, using a KRAFT 2% Milk Singles and OSCAR MAYER Light Bologna.